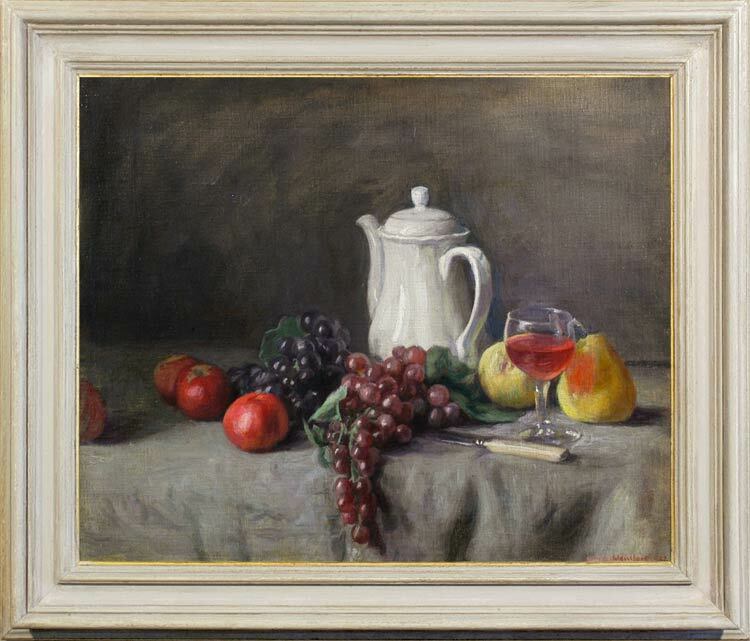 This painting is closely related to Chardin’s Still life with teapot, grapes, chestnuts, and a pear (Boston MFA), mirroring and undercutting its composition (coffee pot facing the other way, red instead of white grapes, draped instead of bare table). Chardin is the sine qua non for many still life painters; his compositions possess both concrete reality and a metaphysical quality hinting at the Platonic ideal; many of them also managing to transcend their historic period, as in this case. Weissbort’s fascination with Chardin’s achievements underpins many of his still life paintings, rooting them in the long tradition of European still life artists, and drawing in the spectator, who often experiences a similar fascination with this apparently modest genre of painting.